Lyme Insomnia Explained - How To Overcome It! Lyme Insomnia is basically difficulty with falling asleep due to an infection with Lyme disease. The word "insomnia" means "no sleep" or "lack of sleep". There are many causes of insomnia, and Lyme disease is just one of them. You can get Lyme disease if you get bitten by a tick that is carrying the bacteria responsible (Borrelia Burgdorferi). The bacteria in the tick bite can then get into your blood stream, and they begin to multiply, resulting in the infection known as Lyme disease. There are many symptoms associated with this bacterial infection, and one of the most common symptoms is called Lyme insomnia - although not everybody with Lyme will also have insomnia. 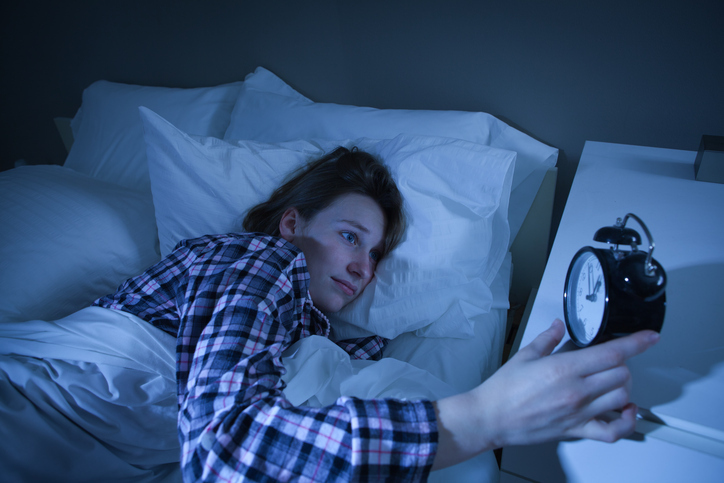 Insomnia (trouble falling asleep) is pretty much one of the most frequent things that people affected by Lyme disease will notice. When doctors are evaluating patients who are currently undergoing treatment for Lyme, there is one thing in common, and that is that almost ALL patients complain that can't get any sleep. This sounds like something "not too bad" at first, BUT it quickly becomes a problem. Sleep is extremely important for humans - and we need GOOD QUALITY sleep, too! All the cells and tissues in our bodies are constantly being broken down and worn out, and are repaired and re-built during sleep. So sleep is an essential part of being a human! BUT we need the sleep periods to be of LONG ENOUGH duration, and of GOOD ENOUGH quality. Simply put, our bodies are unable to heal and repair if we are not getting enough sleep. You start to become fatigued, and feel worn-out. How does Lyme disease cause Lyme insomnia? The human body has a rhythm through the 24 hour day (the "circadian rhythm") that allows for the production and release of various hormones such as melatonin. Melatonin is made by the pineal gland, and it is a sleep hormone that helps the human body relax in preparation for sleep. More melatonin results in increased ability to sleep. But if our bodies are not producing enough melatonin, then it starts to become more difficult to fall asleep. When you have Lyme disease, your body's immune system is working hard trying to fight the bacteria. Your immune system is fully engaged, and all fired up to battle the foreign invaders (the bacteria) within your body. This "fired up" immune response has a number of side effects, and one of them is a generalised inflammation throughout your body. This associated inflammation interferes with the normal working of the pineal gland, which is responsible for producing melatonin. SO, with less melatonin being produced, you start to find it harder and harder to fall asleep, and you may even suffer from AN INABILITY TO SLEEP AT ALL. Another reason why you might have insomnia caused by Lyme disease is because when your immune system is working overtime battling the bacteria, you will often have a significantly high fever. When a fever increases and then decreases, and then increases again in a cycle, you will become very uncomfortable, fatigued, irritable, and just feel plain horrible! You just aren't able to relax enough to actually go to sleep. JUST TO MAKE THIS SITUATION EVEN WORSE, when your immune system is overworked, you actually need MORE sleep to recuperate. This creates a circle, because you're finding it very hard to get ANY sleep, despite actually NEEDING more sleep. This obviously becomes EXHAUSTING in quite a short space of time!. Lyme insomnia occurs in many (but not ALL) patients who have been affected with Lyme disease. It is a symptom that may occur in all stages of lyme disease: both early and late. So just because you're not having any problems sleeping at first, don't think you've got away with it. Difficulty sleeping may well start to appear in the later stages of the disease, just when you think you're getting better. Obviously, it's important to speak with your doctor to find out your options for dealing with your Lyme insomnia, BUT there are things you can do yourself at home. There are A LOT of recommendations out there from many different sources. Let's go through them, starting with the simplest. After all, different people will have differing DEGREES of insomnia; Quite a few folk will be able to reduce their sleep issues with relatively simple measures! Keep a strict routine - go to bed at the same time each night, and get up at the same time every morning. Do not use any electronic devices such as smart phones, iPads, computers or televisions at least 1 hour before your planned bedtime. The light emitted by the screens on these devices tricks your brain into thinking it's still daytime, and inhibits melatonin production. Some people also recommend actually switching off your phone, iPad, computer, and wireless routers. I think these steps are sensible. But they also recommend switching off the entire power supply for your house at the circuit breakers, and getting a Faraday cage to sleep in, to "shield out electro-magnetic radiation". I am not aware of any solid scientific research employing "double blind" testing that provides any evidence that electro-magnetic radiation from your house wiring can interfere with sleep. So leave your circuit breakers alone! Try reading a book and / or listening to quiet music before bedtime. I listen to the Shipping Forecast. Try drinking a herbal tea with valerian root or extract in it, an hour before bedtime. Many people also find taking a warm bath about an hour before bedtime helpful; BUT don't have the water too hot. And make it part of your ROUTINE. The repeated routine before bedtime is the important thing. One piece of technology that I STRONGLY RECOMMEND to help you create AND STICK TO your sleeping/waking cycle is an alarm clock that uses a simulated sunrise to wake you in the morning. The light increases in intensity from zero to maximum over about 30 minutes, making your brain perceive that the sun is up, and it's time to wake up. This trick can be EXTREMELY effective in setting your wake/sleep routine. I highly recommend the Sunrise Alarm Clock by eBright at Amazon. This device works well and is extremely good value for money. AFTER you have tried ALL of the above, and you haven't had much success, it's time to move up. BUT STICK TO THE ROUTINE I've described above. That routine is the foundation for everything else! These tablets have been lab tested by an independent laboratory in a study of the top-selling melatonin supplements in the USA. The Nature Made Melatonin 5 mg are top-rated for QUALITY and also offer the BEST VALUE. I highly recommend them. Next step could be to see your doctor about some medical-grade sleeping medication or sedatives. I'm NOT so keen on this route, because, although sedatives will help you sleep, they DO NOT give you a natural sleep where your brain goes through the normal sleep cycles. AND when you wake up in the morning, you can feel quite drowsy. It can be HARD to get out of bed, which leads to you breaking your carefully-constructed sleep routine. And when you DO get up, you can feel fuzzy-headed all day. NOT IDEAL. Another doubtful "solution" (in my opinion) is a NEUROFEEDBACK device, which is supposed to modulate your brainwaves and assist in sleep. One such system is from ClearMindCenter. BUT the research is sketchy, and this technology DOES NOT have FDA approval for any of it's claims. Next up is something I am NOT recommending, but I have to mention it; Cannabis. After decades of bad press and a poor "drugs" image, the medical benefits of cannabis are being promoted just about everywhere. In some states of the USA and some countries around the world, cannabis use has been legalized. BUT THERE ARE PROBLEMS WITH CANNABIS. Although there is some research to back up the use of cannabis as a sleeping aid, New Scientist magazine recently stated (November 18 2018 issue) that in the USA, medical cannabis is in a legal limbo. Science writer Clare Wilson reported that "although medical cannabis has gained approval at state level, it is still banned under Federal law. This means the FDA cannot regulate cannabis-based products, the way it can for pharmaceuticals and other remedies." Wilson also wrote "The market suffers from a lack of quality control. Over TWO THIRDS of U.S. medical cannabis sold online have either a higher or a lower amount than stated of the therapeutic component, cannabidiol." Actually, some of the medical cannabis products sold online had almost nothing in them, according to Marcel Bonn-Miller at the university of Pennsylvania, Philadelphia, who carried out the research. The lack of regulation means YOU DON'T KNOW WHAT YOU'RE GOING TO GET when you order medical cannabis online. Keith Humphreys of Stanford University said "of all the things that are called a medicine, NO DRUG is less regulated than marijuana". SO,THAT'S THE DANGER. In theory, medical grade cannabis products can help with insomnia. BUT in the real world, it's not easy to get a reliable product and a reliable dose. Do you want to gamble with your health? Another approach according to some authorities is to take anti-histamines, to combat elevated histamine levels in your body. The thing about this idea is that nearly all anti-histamines will make you drowsy anyway, so it's hard to tell if you're getting relief from Lyme insomnia due to the lower histamine levels in your system, or whether you're just drowsier anyway due to the side-effects! The problem I have with this approach is that, again, you wake up still drowsy, and it can take a real effort to get out of bed in the morning.The best compromise here is to look for foods that have a natural anti-histamine effect, in particular the spice turmeric, but also vitamin C and siberian ginseng. SO, IS THERE ANYTHING ELSE THAT WORKS? Yes! One of the BEST options in the battle against Lyme insomnia is self hypnosis by downloaded MP3 file. And of all the hypnosis downloads available, the BEST is Hypnosis Downloads - Sleep Problems. This insomnia-busting technique is highly under-rated, but incredibly effective. I recommend clicking through to that link and trying out a downloaded hypnosis session. SO, while Lyme insomnia can be a severe, draining condition, there ARE a number of things you can do to improve your quality of sleep. Just remember to build up the tips I have given you in layers. Just because one suggestion doesn't work for you, DON'T DISCARD IT. Move on to the next option, ADDING IT to the steps you have already taken.